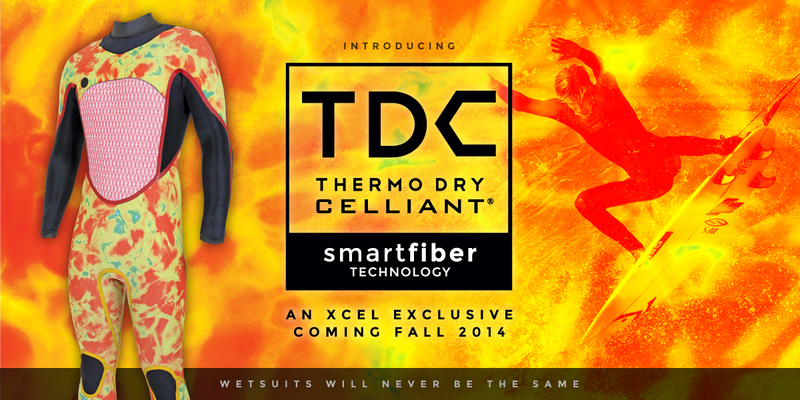 Xcel, the leader in premium wetsuit technology, is excited to announce its upcoming launch of TDC Thermo Dry Celliant®, the first and only clinically proven, smart fiber wetsuit lining set to make its market debut for Fall 2014. "TDC is the warmest wetsuit lining ever in over thirty years of Xcel product development," says Lance Varon, Xcel Design Director. "From the moment you put it on, TDC transforms your body into a renewable source of warmth, while improving your ability to achieve peak performance." Celliant's effectiveness, tested rigorously in and out of the water by Xcel's athletes and R&D teams, has also been demonstrated in numerous independent clinical studies and third-party clinical trials. "The results of TDC's extensive testing far exceeded our expectations, and have redefined what Xcel can achieve in terms of wetsuit warmth and performance," continues Varon. "Comparing TDC to other materials, we could literally see and measure the significant increase in warmth. We're excited to partner with Celliant and to be bringing this groundbreaking technology – and its real-world benefits – to market." "TDC is an exciting alliance of Xcel's wetsuit expertise and Celliant's proven science," says David Horinek, Celliant inventor. "The infrared energy delivered by TDC improves circulation and increases tissue oxygen levels, which in turn increase warmth, fend off fatigue, improve stamina, and quicken recovery times in everyone from non-athletes to professionals alike." Continues Horinek, "The cold air and/or water conditions that necessitate a wetsuit are the same conditions in which you'll benefit from improved circulation and greater tissue oxygen. So for surfers, this means quick and easy access to these performance benefits, simply by putting on their wetsuit." TDC's smart fiber technology is driven by Celliant's patented, proprietary mineral blend and unique manufacturing process. Naturally occurring and thermo-reactive, the minerals are embedded into staple fibers, which are then spun into Celliant yarn to create the final TDC smart fiber lining. "What's also unique about TDC is that, since the Celliant mineral blend is embedded at the fiber level, TDC technology will never wear off or wash out, so its benefits last for the lifetime of the wetsuit," adds Varon. TDC will be available exclusively in Xcel's Fall 2014 Drylock, Revolt, and Infiniti fullsuit series; and in Xcel's full line of Fall 2014 Drylock accessories. "I couldn't believe how warm I was during my first surf in the new Drylock with TDC," says Xcel team athlete Mike Gleason. "Hands down, it's the warmest suit I've ever worn. Plus, after a few very long, very cold East Coast winter sessions, it was amazing to realize how consistently strong and comfortable I felt. It really made a world of difference." "Because TDC is so versatile, we now have the potential to develop products that use less foam and are even more lightweight, while still delivering unparalleled warmth and built-in hydrophobic properties," adds Lance Varon. "It's a truly revolutionary breakthrough with exciting future applications." "Xcel has been a product driven brand since we hand-made our first wetsuit in 1982," continues Varon. "TDC represents a huge leap forward in our continued commitment to designing wetsuits as complete systems that use proven technologies to deliver real-world benefits." Celliant is a revolutionary, patented technology that harnesses and recycles the body's natural energy through the medium of fibers. Celliant's applied science utilizes a blend of minerals and proprietary ingredients that are embedded into the core of the fiber. Fibers, yarns, and fabrics with Celliant technology can be found in some of the world's most recognized name brands. For more information, visit celliant.com.